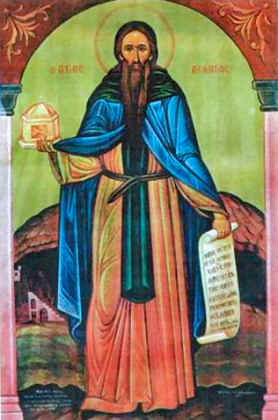 St. Leontios was born around 1377 in Monemvasia of Peloponnesos to an aristocratic family, a descendent of the Palaiologoi emperors of Byzantium. His mother was Theodora, daughter of Emperor Andronikos (1283-1328), and his father was Andrew, the Governor of the Peoponnese. Both his parents were God-loving people and named their son Leo. Leo had a sharp mind and lived a pure life, being nurtured on the Scriptures and the texts of the Holy Fathers. He was sent to Constantinople for advanced studies in science and philosophy, and excelled in learning. Upon the death of his father, Leo left Constantinople and returned to Monemvasia to help and comfort his mother. Theodora eventually entered a monastery, and through her blessing Leo took to himself a wife and had three children. An exemplary husband and father, soon tragedy befell him and his wife and children died (another account says that his wife and children gave him the blessing to become a monastic while she kept the inheritance). This allowed him to embrace the monastic life in 1410 nearby at the Monastery of the Panagia the Hope of the Hopeless (today it is the Monastery of Pepelenitsas), and he took the name Leontios. There he lived under the direction of an ascetic named Mennidis, and eventually went to Mount Athos. After staying in Mount Athos for some time and growing in virtue, St. Leontios returned to Monemvasia and became an ascetic. It was revealed to him that he should head north, to the mountain known as Klokon the Elder (now known as "Old Monastery"), above Aigio. At the base of the rock there was a natural cavity, which became inhabited by the newly-arrived monk. Soon disciples were attracted to this holy elder. 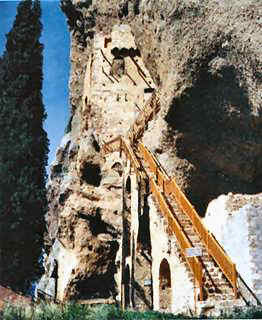 In this craggy space he built a small church dedicated to the Archangel Michael, which became known not only in the immediate area, but all over Greece, and even reached Thomas and Demetrios Palaeologos, who in his honor, offered the means to establish a majestic monastery in Leontios' place of asceticism, Kloko. This is the Monastery of the Pammegiston Taxiarchon (the All-Great Archangels) in Aigialeias, Peloponnese. 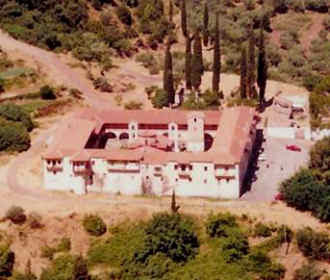 The Palaeologos family gave the monastery many farms and built a reservoir. They also donated relics of the Saints, especially ones from the Awesome and Holy Passion of the Lord, including a portion of the Honorable Cross, the Crown of Thorns, the Sponge, the Purple Robe of the Lord, and also part of the ascetical garment of St. John the Forerunner, the first monastic. 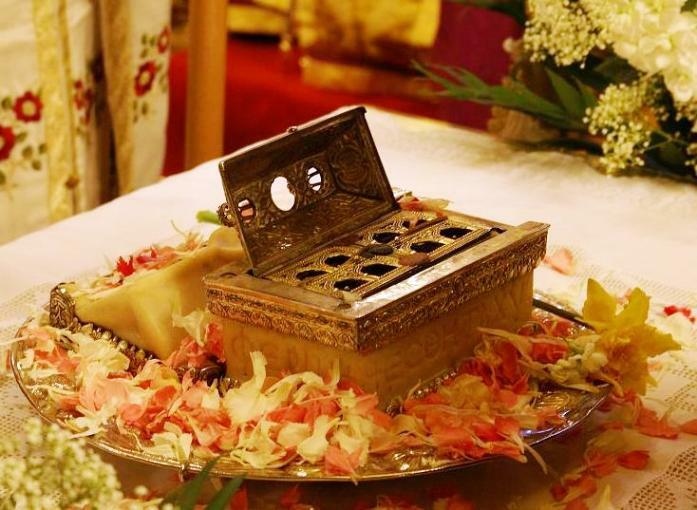 Also, according to tradition, the marble container which holds these relics is made from stone from the tomb of Christ, and dates to 180 AD. St. Leontios, who as a man, monastic, and abbot worked wonders and enlightened all those who asked of him, fell asleep in the Lord on December 11th, 1452, at the age of 75. His Honorable Body, in which he struggled in life, was placed in his cave, and forever pours forth healings to those who approach him with faith. In asceticism you shined, as gold in the furnace, you illuminated Monks, the choirs who followed, with your divine teachings, O God-bearer Leontios, and today, celebrating your light-bearing memory, intercede for us, entreating the Lord.